Philadelphia, PA (December 19, 2018) — Former world title challenger, “Hammerin” Hank Lundy will take part in the eight-round main event on Friday night, March 1st at The 2300 Arena in Philadelphia. The show is promoted by King’s Promotions in association with CES Boxing and Titans Boxing Promotions. Lundy, who turns 35 on January 3rd, will be making his 9th appearance in his hometown. The 13 year-professional has took the “Anyone-Anywhere” slogan into his career. He has wins over Esteban Almarez (7-0), Jason Cintron (10-0), former world champion Richar Abril (12-1-1), Tyrese Hendrix (18-0-1), Omri Lowther (14-1), Patrick Lopez (20-3), former world champion David Diaz (36-3-1), Dannie Williams (21-1), Ajose Olusegun (31-1), John Delperdeng (10-1), and former world champion DeMarcus Corley. 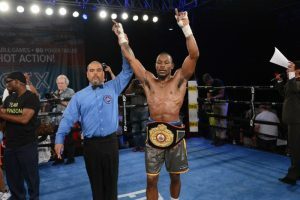 Lundy challenged for the WBO Super Lightweight world championship, but came up short when he took on Terence Crawford on February 27, 2016 in New York. Lundy has also fought world champions Ray Beltran, Viktor Postol and Mauricio Herrera. In his last bout, Lundy dropped a close 12-round decision to undefeated Zair Abdullaev in September 7th in Russia. Lundy’s opponent will be named shortly. In the exciting co-feature, it will be an classic “Philly vs. Philly” showdown as Tyrone Brunson takes on Jamaal Davis in a 10-round battle for he Pennsylvania State Middleweight Title. Brunson of Philadelphia has a record of 27-7-2 with 24 big knockouts. Brunson, who will be 34 years old, is a 14 year professional who started his career with a record 19 consecutive 1st round stoppages, has defeated the likes of James Morrow (8-1-2), Brandon Quarles (18-3-1) and former world champion Kermit Cintron (39-5-3). Brunson entered The Contender Tournament, and is coming off a six-round unanimous decision over Davaun Lee on November 9th. Davis of Philadelphia has a record of 18-13-1 with seven knockouts. Davis is a 16 year professional, who owns wins over Joey DeMalavez (2-0), Terrance Williams (4-1), Blake Mansfield (6-1-1), and in his last bout he won a eight-round unanimous decision over Troy Artis on November 17th. Also seeing action will be undefeated welterweight Poindexter Knight (6-0, 3 KOs) of Philadelphia; Super Featherweight Antonio DuBose (9-2-1, 2 KOs) of Philadelphia and cruiserweight Roy McGill (6-1, 3 KOs) of Harrisburg, PA in six-round bouts. Undefeated super bantamweight Rasheen Brown (2-0) of Philadelphia; Welterweight Rasheed Johnson (4-2, 1 KO) of Philadelphia; Featherweight Yeuri Andujar (3-0, 3 KOs) of San Cristobal, Dominican Republic; middleweight James Martin (3-0) of Philadelphia and crusierweight Angel Rivera (4-0, 3 KOs) of Harrisburg, PA in four-round bouts. May 10th, October 25th and December 6th.